Minimum $12 for up to 15 WORDS. 16-30 words: $20. 31-45 words: $40. Box: $4. Click here to place your classifieds for next weeks issue. ANTIQUE PARTNER DESK: All wood, $1,000. See at The Islander office, 3218 E. Bay Drive, Holmes Beach. FOUR OAK OFFICE chairs: Antiques, perfect for eclectic dining set. 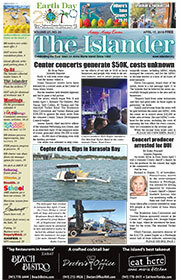 The Islander newspaper, 3218 E. Bay Drive, Holmes Beach. NEED A TUTOR to help with the math you aren’t sure how to do? I am a 6th-12th grade certified math teacher with 30 years of tutoring experience. 941-524-4177. WANTED: WORKOUT DVDs and retired but working XBox, Wii units with games for Ministry of Presence for kids and teens in Haiti. Deliver to The Islander, 3218 E. Bay Drive, Holmes Beach. WANTED: YOUR OLD cell phone for recycling. Deliver to The Islander, 3218 E. Bay Drive, Holmes Beach. AERIAL PHOTOS of Anna Maria Island. View and purchase online: www.jackelka.com. FREE GUN LOCK courtesy of Project Childsafe, Florida Fish and Wildlife Conservation Commission and Holmes Beach Police Department. Pick up at The Islander office, 3218 E. Bay Drive, Holmes Beach. Don’t be sorry, be safe. ROSER THRIFT SHOP: Open 9:30 a.m.-2 p.m. Tuesday and Thursday, 10 a.m.-1 p.m. Saturday. Annex open until noon same days. Donations preferred on Wednesdays, 9-11 a.m. 511 Pine Ave., Anna Maria. 941-779-2733. GARAGE SALE: 9 a.m.-1 p.m. Saturday, Aug. 19 only. 11001 Bristol Bay Drive, Perico Apartments, Bradenton. Turn left at stop sign and turn left again. Look for garage sale signs. YARD SALE: 9 a.m.-2 p.m. Friday and Saturday, Aug. 18-19. 202 E. Peacock Lane, Holmes Beach. YOU CAN HELP! Foster or volunteer for Moonracer Animal Rescue. www.moonraceranimalrescue.com to apply. BIMINI BAY SAILING: Small sailboat rentals and instruction. Day. Week. Month. Sunfish, Laser, Windrider 17 and Precision 15. Call Brian at 941-685-1400. PONTOON BOAT RENTAL Create life long memories. Call 941-778-2121 or see boatflorida.net. HOUSEKEEPER: PART-TIME at Haley’s Motel. Must have own transportation and speak English. Prior experience required. Haley’s is a non-smoking property. 941-778-5405. REPORTER WANTED: Full- to part-time. Print media, newspaper experience or journalism degree required. Apply via email with letter of interest to news@islander.org. KIDS FOR HIRE ads are FREE for up to three weeks for Island youths under 16 looking for work. Ads must be placed in person at The Islander office, 3218 E. Bay Drive, Holmes Beach. ISLAND COMPUTER GUY, 37 years experience. On-site PC repairs, upgrades, buying assistance and training. Call Bill, 941-778-2535. CLEANING: RESIDENTIAL, COMMERCIAL and resort. Love what we do, love to work. 941-756-4570. VACATION CLEANING: COMMERCIAL, residential and resorts. Roofs, buildings, houses driveways, paver sealing. Pressure washing and windows also available. 941-251-5948. AUTHORITY ONE SERVICES: Cleaning, vacation rentals, resorts, real estate, commercial/residential cleaning. Ask about our exterior cleaning services. Call 941-565-3931. U FLY I drive your car anywhere in the USA. Airport runs, anywhere. Office, 941-447-6389. 941-545-6688. NEED A RIDE to the airports? Tampa $65, St. Pete, $55, Sarasota, $30. Call Gary, 863-409-5875. Email: gvoness80@gmail.com. AIR B&B CONSULTANT: Turn your vacant property into a cash flow machine. Free consultation. 240-682-4010. NO WORRIES! PEGGY, R.N. care, seniors. Sitting for kids and pets, errands, rides, cleaning, etc. 727-902-7784. MATURE WOMAN WILL clean condo, house. Monthly and weekends. References available. 941-348-8419. FEMALE CAREGIVER SEEKING employment. Light housekeeping, making meals, running errands. Certified, references. Call Michelle, 801-833-8146. BUSINESS-TO-BUSINESS JD’s Window Cleaning looking for storefront jobs in Holmes Beach. I make dirty windows sparkling clean. 941-920-3840. BEACH SERVICE air conditioning, heat, refrigeration. Commercial and residential service, repair and/or replacement. Serving Manatee County and the Island since 1987. For dependable, honest and personalized service, call Bill Eller, 941-795-7411. CAC184228. ANYONE CAN TAKE a picture. A professional creates a portrait. I want to be at your wedding! www.jackelka.com. 941-778-2711. RELAXING MASSAGE IN the convenience of your home or hotel. Massage by Nadia, more than 19 years on Anna Maria Island. Call today for an appointment, 941-518-8301. MA#0017550.MA#0017550. CONNIE’S LANDSCAPING INC. Residential and commercial. Full-service lawn maintenance, landscaping, cleanups, hauling and more! Insured. 941-778-5294. TREES BY BREEZE: Tree trimming, landscapes, maintenance, insured. “What’s said is good as done.” 941-778-2837. ISLAND LAWN SPRINKLER Service: Repairs, installs. Your local sprinkler company since 1997. Call Jeff, 941-778-2581. SHELL DELIVERED AND spread. $55/yard. Hauling all kinds of gravel, mulch, top soil with free estimates. Call Larry at 941-795-7775, “shell phone” 941-720-0770. NATURE’S DESIGN LANDSCAPING. Design and installation. Tropical landscape specialist. Residential and commercial. 35 years experience. 941-448-6336. STRAIGHT SHOT LANDSCAPE: Shell, lime rock, palms, river rock, construction demolition, fencing, pressure washing, hauling debris and transport. Shark Mark, 941-301-6067. VAN-GO PAINTING residential/commercial, interior/exterior, pressure cleaning, wallpaper. Island references. Bill, 941-795-5100. www.vangopainting.net. CUSTOM REMODELING EXPERT. All phases of carpentry, repairs and painting. Insured. Meticulous, clean, sober and prompt. Paul Beauregard, 941-730-7479. TILE -TILE -TILE. All variations of ceramic tile supplied and installed. Quality workmanship, prompt, reliable, many Island references. Call Neil, 941-726-3077. GRIFFIN’S HOME IMPROVEMENTS Inc. Handyman, fine woodwork, countertops, cabinets and wood flooring. Insured and licensed. 941-722-8792. JERRY’S HOME REPAIR: Carpentry, handyman, light hauling, pressure washing. Jack of all trades. Call 941-778-6170 or 941-447-2198. ISLE TILE: QUALITY installation floors, counters, backsplashes, showers. Licensed, insured. Call Chris at 941-302-8759. ANNA MARIA HOME Accents: 20 years experience in building and remodeling. Local, licensed and insured. No job too small. We accept all major credit cards. 786-318-8585. I CAN FIX that! No job too small. 20 years experience. Remodel, new construction. Call Brent, 941-524-6965. PROFESSIONAL PAINTING SERVICES: Prompt and reliable, meticulous, thorough, quality workmanship. Interior/exterior, wallpaper removal. Also minor repairs and carpentry. Free written estimates. Bill Witaszek, 941-307-9315. WEEKLY/MONTHLY/ANNUAL rentals: wide variety, changes daily. SunCoast Real Estate, 941-779-0202, or 1-800-732-6434. www.suncoastinc.com. CHARMING ANNUAL BEACH Bungalow: Full Gulf views. 3BR/1BA. New carpet, fans, air conditioning, shaded private driveway. Relaxing area for a hammock, washer and dryer. $1,550/month, plus security. 941-753-8866. ANNUAL RENTAL: 5BR/2.5BA, boat dock, boat lift, large pool, fenced yard, landscaped, (pool and landscaping maintenance included), right off the island, four houses from the bay! $3,500/month. Contact Steve, 908-642-4340. REAL ESTATE: BUY, sell, invest. Enjoy. Billi Gartman, Realtor, An Island Place Realty. 941-545-8877. www.AnnaMariaLife.com. STARTING FROM THE upper $200,000s. Only minutes from the beach, this new, active adult community is perfectly located just south of Manatee Avenue off Village Green Parkway. Perfectly designed, open 2BR or 3BR/2BA plus den and two-car garage floor plans. Luxurious amenities, pool, spa, gym, pickleball and fenced-in dog park. HOA only $190/month. Models open daily. Contact us, 941-254-3330. www.MirabellaFlorida.com. OPEN HOUSE: 2-4 p.m. Friday, Saturday, Sunday, Aug. 18-20. No barking dogs in this 55-plus quiet Village Green street. 2BR/2BA updated villa. $204,900 with a $5,000 allowance for baths at closing. 708 67th St. W. Bradenton. Carolyn Spencer, 941-730-0496. Engel & Voelkers Realty, south Tampa.